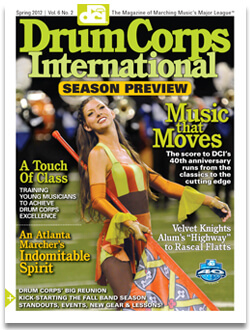 Drum Corps International Magazine | Spring, 2012 | Vol. 6 No. 2 Click magazine to read in full screen. The Sweet Sound of Success No one knows who will win, but one thing's certain: You'll hear great music throughout the summer. Learn who's playing what—and why—in our 2012 Season Preview. The Field Is Their Classroom How do drum corps groups transform "band kids" into elite marching musicians? We asked World and Open Class instructors to share their methods and recommendations to help new members make the grade in Marching Music's Major League. Standouts Recognizing the achievements of outstanding drum corps members. Age-Out Rascal Flatts bandleader Jim Riley still connects with his days in the Velvet Knights. Commitment to Excellence Spirit of Atlanta's Darryl "DJ" Turner wouldn't let cancer silence his horn. Plus Kick Start your fall band season this summer ... The biggest drum corps reunion in history ... Devils March in Malaysia ... and more!